You must be a member of the Berlin Vegans & Vegetarians Group to attend this activity. Would you like to join this group? This Sattvic food Restaurant in the heart of Charlottenburg is a hidden gem. 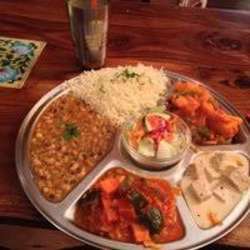 They serve vegan and vegetarian Indian food, and every Sunday they have a delicious Buffet, everything is Vegan except for one of the deserts which is vegetarian. If you don't like what the Buffet has to offer you can always choose something from the menu and pay accordingly.